The importance of viewing a PBS as an integral piece of the greater transportation system — and more broadly as a part of the city or region as a whole — cannot be emphasized enough. 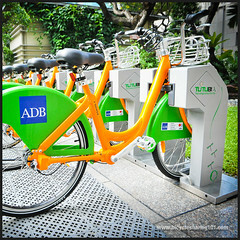 The integration of bicycle sharing into existing and planned transport infrastructure and community life will increase the experience and utility to the user, who generally thinks of the journey as a whole — not each part: walking, taking a bus and then a bicycle — and thus the constituent parts should be perceived by them to combine seamlessly into one linked trip. The end goal of any transit planning should be to get a person from where they are to where they are going, rather than just focusing on one unlinked aspect of their journey — a common mistake in transport planning by disjointed agencies. And this is where bicycle sharing plays perhaps its most significant role: instead of just being a beneficiary of transit integration, it can itself be an important integrator. Transit use is commonly measured by the number of passenger “trips” taken. However, there are at least two ways of measuring a “trip.” The simplest and thus most common measure is called an “unlinked trip,” which counts the number of persons boarding a transit vehicle. Measurement of “linked trips” counts the number of trips taken on transit that connect the passenger’s origin on the transit system to their destination on the transit system. Our assumption is that the latent PBS user thinks of their journey as one linked trip, rather than unlinked constituent trips. 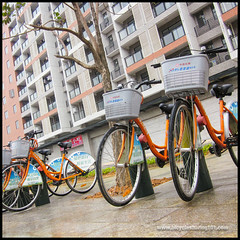 The photographs and figures below illustrate some of the aspects of the ‘Location Planning’ chapter in the book Bicycle Sharing 101: Getting the Wheels Turning. They are meant to be viewed in the context of reading that chapter. Above: In Lanzhou, China, the very obvious boundaries of a mountain range and a river define the catchment area of the system, while Washington D.C.’s Potomoc River splits the Capital Bikeshare catchment area. 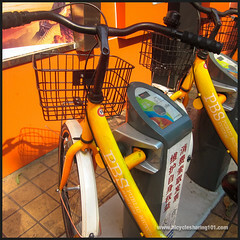 ABOVE: As illustrated by this underground parking system in Tokyo and stacked bicycle parking in Kyoto, Japan is ahead of the curve on developing bicycle parking infrastructure that can be applied to PBS. ABOVE: This map of the Public Bicycle Company system in Guangzhou, China, illustrates the circular catchment areas of each station, though it is not strictly accurate, as some of the major roads on the edge of the coverage area form particularly significant barriers. ABOVE: This station in China’s Hangzhou is located at a busy intersection and placed directly adjoining the BRT station. 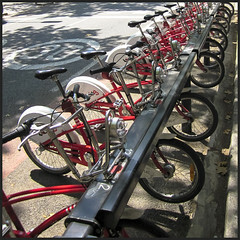 ABOVE: This station in Barcelona fits neatly into what was previously on-street parallel-parking spaces for cars. 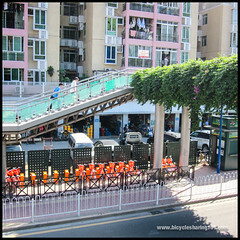 ABOVE: Pedestrian overpasses such as this one in Guangzhou, China, offer a place for a station while also providing protection from the elements such as sun and rain. ABOVE: This artist rendering of a bicycle sharing station is underneath a flyover along the BRT in Rajkot, India. ABOVE: This station, also in Guangzhou, shows how neatly a station can fit into what was previously dead space. ABOVE: The grass-and-paving mix in this system in Zhuzhou, China, enables drainage for runoff from the surrounding paved areas. FIG 1: The table below shows a simple approach when planning station size at respective locations. 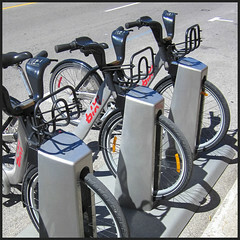 ABOVE: Physically segregated bicycle lanes, such as these in Guangzhou, China, and Montreal, Canada, provide the greatest protection to cyclists. ABOVE: Painted bicycle lanes, such as this one in London, can be an easy retrofit to existing roadways. ABOVE: A bicycle ramp on stairs in Beijing, China, allows cyclists to cross major highways by sharing pedestrian overpasses.